The ProForm 570 CrossWalk treadmill is designed to give an “upper body workout” when the user holds on to the moveable arms as he walks. Icon Fitness makes several low cost CrossWalkers like this, but they are nothing more than a gimmick to make you think you are getting some kind of an advanced workout machine. The moving handles don’t really add much to your workout. The ClearView™ backlit console on the ProForm 570 CrossWalk treadmill shows your progress when you choose the Manual setting, or from the 12 Personal Trainer workouts, or the 3 CrossWalk workouts. It also has a built-in fan, a fold-up design, and a large user weight allowance. UPDATE: The ProForm 570 Crosswalk is no longer available. To find a comparable treadmill check out the new full lineup from ProForm on the company site to see which model appeals to you. 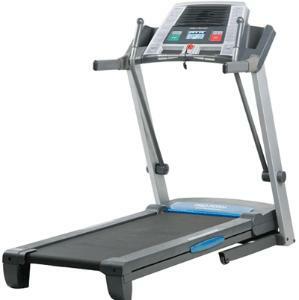 The Proform 570 CrossWalk treadmill comes equipped with a weak motor even though it’s covered by a 25-year warranty. Icon must reason that they can afford to toss in an impressive long motor coverage -- because the other parts and labor warranty is so limited, the consumer is likely to have troubles in those areas first. These cheap treadmills aren’t built to last so the 25-year warranty is meaningless. Experts and fitness trainers could easily name a dozen or more $600 treadmills that they would recommend over this one. 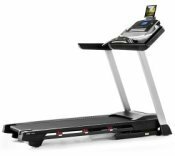 Customers have remarked in treadmill reviews that they are surprised by the solid feel and stability on the ProForm 570 CrossWalk, but the console looks and responds cheaply compared to competitor models. The heart rate monitors never seem to work correctly on these low budget machines, and the workout arms are flimsy and worthless -- better to spend $10 bucks on a pair of 2-lb weights and stride with them on the belt as you walk. The $599 ProForm 570 CrossWalk under-performs in areas of power, reliability, quality, noise, and parts/labor warranty. The roomy walking area is sufficient for the price but that’s about all that is. If you still want a treadmill that offers “upper body workouts,” we recommend you closely compare the ProForm 570 CrossWalk treadmill to the Gold’s Gym Maxx CrossWalk 650, which is also an Icon Fitness product. For the same price of $599, the Gold’s gym treadmill also comes with iPod compatibility, adjustable cushioning, an incline, and a whole lot more value for your money.